Cairns is a regional city in Far North Queensland in Australia. The town was founded in 1876. It is named after William Wellington Cairns, who at that time was Governor of Queensland. The town was founded in order miners who worked in the gold deposits of the river Hodgkinsonto live there, but a fall came, when an easier route from Port Douglas was found. The population of Cairns is about 150 000 people. Later it became a railway hub and a major port for the export of sugar cane, gold and other metals, minerals and agricultural products from the surrounding coastal areas. Cairns is a popular tourist destination for foreign tourists because it is characterized by its tropical climate. It serves as a starting point for people who want to visit the Great Barrier Reef and North Queensland. Prior to British settlers arriving, the area around Cairns was still populated by people from the tribe Walubarra Yidinji, who still believe the ground is their property. In 1779 James Cook chose on the map a place where Cairns will be built, and called it Trinity Bay. One hundred years later the place was converted into a port. Cairns was founded because of the need for export of gold found there. The area is covered mainly by mangrove trees and typical sand ridges. Marshes have been gradually cleaned and filled with sawdust from local sawmills and ballast from the quarries. The scrap is also used in the construction of the railway line. The ground began to be used for agriculture – on it is grown sugarcane, maize, rice, bananas, pineapples and many dairy products. 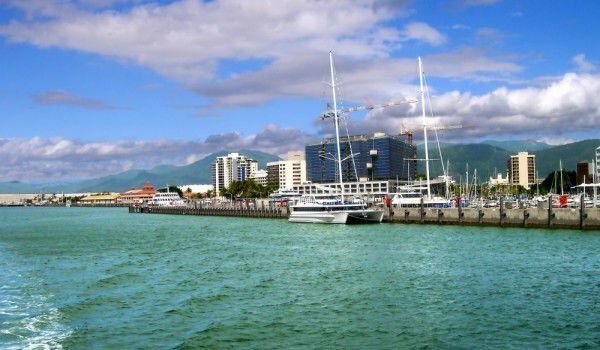 The success of local agriculture helped Cairns to establish itself as a port and accelerates economic development. During World War II, Cairns was used by Allied forces as a base for operations in the Pacific. U.S. Air Force, Royal Australian Air Force, U.S. Navy and Royal Australian Navy all had bases near the present port. After World War II, Cairns slowly turns into a powerful tourist center. The opening of Cairns International Airport in 1984 has helped to strengthen the status of the city as a desirable destination for international tourism. Northern Beaches of Cairns consist of beaches to the north along the coast. Each individual beach suburb is located at the end of the road stretching from Captain Cook Highway. From south to north these are Machans Beach, Holloways Beach, Yorkeys Knob, Trinity Park, Trinity Beach, Kewarra Beach, Clifton Beach, Palm Cove, Ellis Beach. The center of Cairns is close to the suburbs of Cairns North, Park Parramatta, Portsmith, Manunda, Manoora, Kanimbla, Mooroobool and Woree. Several small towns and communities in the jurisdiction are served by Cairns Bruce Highway.